Blake Griffin and the L.A. Clippers Foundation Team with Vision To Learn; Over 600,000 students and their families will benefit from the partnership. 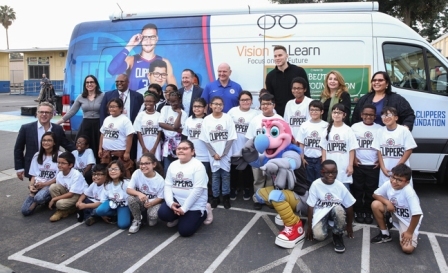 Blake Griffin and the L.A. Clippers Foundation have partnered with non-profit Vision To Learn and the Los Angeles Unified School District (LAUSD) to provide free eye exams and glasses to every LAUSD student in need throughout the district. Out of over 600,000 LAUSD students, an estimated 15 to 20 percent need glasses. 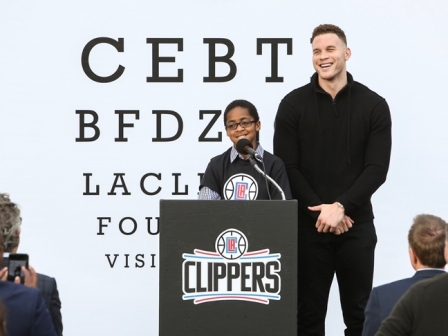 Over the next two years, every student K-12th grade in LAUSD who needs an eye exam and glasses will get them, free of charge, thanks to the generous support of the L.A. Clippers Foundation, Blake Griffin, and LAUSD. Ninety-five percent of first graders who need glasses don't have them, in part because their families are low-income and have difficulty accessing affordable vision care. Eighty percent of all learning during a child's first 12 years is visual, making a pair of glasses a critical educational tool. The Clippers and Griffin are teaming with Vision To Learn to solve that problem for LAUSD students because it will help children succeed in school as well as in life. Griffin’s older brother, Taylor, struggled with poor vision as a child and Griffin explained what that meant to him and his family. “I remember going with him to the eye doctor for the first time, and the doctor was surprised how bad his vision was,” Griffin said. “I also remember being jealous of my brother because he got to have these cool glasses and I didn’t. But that was such a huge thing, realizing that he couldn’t see that well until he got glasses. Improving a student’s vision has profound benefits on his or her educational and life outcomes. A study of Vision To Learn’s program by researchers at UCLA’s Mattel Children’s Hospital found that providing a student with glasses boosts his or her math and reading grades, and improves the learning environment for the entire classroom and school. Correcting a student’s vision leads to better behavior in class, better relationships with family members and classmates, and a better approach to life as a whole. The kids tell the story best; "I wish I could have glasses so that it would be clear to see the board and read and write things, and play sports," said Miranda Morales, a fifth grader at Lovelia P. Flournoy Elementary School in South Los Angeles who received her very first pair of glasses today from Griffin. The L.A. Clippers and Vision To Learn held an event this afternoon at Flournoy Elementary with Griffin, Ballmer, Beutner, and LAUSD Board Chair Monica Garcia tipping off the initiative. “The Los Angeles Unified School District is proud to work with the L.A. Clippers Foundation and Vision To Learn to give all of our students access to comprehensive screenings and eye glasses, to help them reach their fullest potential,” said Garcia. Eye exams are beginning in all LAUSD schools now, starting with Lovelia P. Flournoy Elementary. The exams will feature Clippers and Blake Griffin-branded mobile clinics and future interactions between the Clippers and the program will include in-arena visits and follow-up school visits with Ballmer, Griffin, and other Clippers personalities. This is the third year the Clippers have supported Vision To Learn, with the partnership growing each year. The Clippers first worked with Vision To Learn in 2015 to bring vision services to 12,000 students in the Inglewood Unified School District. Following the success of that program, the Clippers’ support of Vision To Learn grew to help 80,000 students in the Long Beach Unified School District. With the team’s support of Vision to Learn growing exponentially in 2017, the Clippers will have solved the vision problem for three Southern California school districts and almost 700,000 students over the next two years.